Our friends at MakeSpace (https://makespace.com/los-angeles/) have come up with this infographic to illustrate ways that clutter harms our lives. Here’s what they have to say about it. Clutter and its causes are in a constant game of ping-pong with each other. A distraction at work causes chores to go unfinished at home. The mountain of plates in the sink causes tension between you and your partner. A disagreement with your spouse makes it difficult to complete that home improvement project together. And back and forth we go. If the game continues, it could have a seriously detrimental impact on your life. From your physical and mental health, to your relationships, career, and finances, clutter can negatively affect you in a myriad of ways. This clutter infographic from MakeSpace, (with offices in Los Angeles, New York City, Chicago, and Washington, DC) helps us determine if clutter is, in fact, ruining our lives, and how to get back in control. What other ways can you think of that clutter impacts your life negatively? Does having too much stuff in your life hinder you from moving forward? Here are a few more ways that clutter interferes with…well, with just about everything. You miss out on family gatherings. You can’t ever host a family gathering. Your kids don’t learn that everything has its place because there are more things than places. Your morning routine with your kids is fraught. You arrive at the office in a frantic state. Your evening rituals are taken up with finding the things your kids need for school the next day rather than reading to them. Your friends are upset because you’re always late because you can’t find the clothes you wanted to wear. Your library books are always late. You seldom get to read the library book because you’re always behind on your chores. You can’t make the meal you wanted to make because you’re missing one key ingredient, which you thought you had but can’t find in the pantry. You have clothes in your closet from a decade ago, or more. You have shoes that don’t fit alongside shoes that do fit. You are late paying the bills because the bills due are mixed up with other papers. You forget to make a follow-up doctor visit because the card the doctor’s office gave you is lost in a pile of other papers. You missed your friend’s dinner party because you mislaid the invitation. You put off exercising at home because you don’t have the space on your floor to do sit-ups. Your sister’s birthday card is always late, not because you don’t remember her birthday, but because you can’t find the stamps. You haven’t written a will because you can’t find the necessary financial papers. You’re reluctant to get rid of anything; you want to keep it, just in case. What other ways does having too much clutter interfere with your life? What’s on your list? We would love to have you share it with us. Much has been made lately – the topic seems to come up every year – about gift giving in this season of so much stuff. Do we buy too much? Do we have too much? Are gifts really necessary? Here’s a look at some gifts that have meaning and resonate far beyond the gift itself. A gift of a donation to one of these groups, or to so many other worthy causes, is a gift that can have a lasting impact. Although we can and do applaud the United Nations Climate Agreement that was signed this month in Paris, there is still much to be done to protect our planet. The Environmental Defense Fund helps to find climate solutions. They “create solutions that let nature and people prosper.” Their $2-for$1 gift match offer, in effect until the end of December, triples the impact of your gift. Heifer Foundation helps make an impact on world hunger and poverty by finding sustainable solutions. You can donate an animal, help promote women’s empowerment, provide basic needs, or fund a project. A favorite place of mine to look for creative programs is New York Times’ columnist Nicolas Kristof’s annual gift guide. Here are a few suggestions from his columns over last few years. Red Cloud Indian School is a private Lakota and Jesuit school educating 600 children on the Pine Ridge Indian Reservation in South Dakota. On the website, click on the Gift Shop for handmade items. Buy a rat! In Angola, “Hero Rats” have been trained to sniff out land mines and save the lives of humans who used to do the job. At Apopo Foundation you can adopt a rat for $7 a month. We all love to eat and the season from Thanksgiving through the New Year provides so many opportunities to eat wonderful food – and often to overdo it. Not everyone gets to share in this bounty. Here is a way to help those in need. Let’s make a choice this holiday season by choosing gifts with meaning. Let’s make a difference this holiday season by choosing to help those in need. Earlier this week I attended an author series featuring two best-selling authors whose new books “challenge readers’ daily approach to work and life.” Gretchen Rubin, author of Better Than Before: Mastering the Habits of Our Everyday Lives, and Anne Kreamer, author of Risk/Reward: Why Intelligent Leaps and Daring Choices Are the Best Career Moves You Can Make, take a look at new ways to approach the small moments in work and in life. There are two kinds of people in the world, or so it’s said, those who divide people into categories and those who don’t, and Rubin and Kreamer definitely divide by category—as a way to better understand ourselves, say the authors. 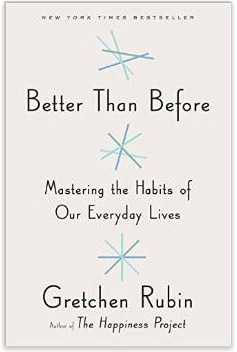 In Better Than Before Gretchen Rubin’s thesis is that the key to changing our lives is to change our habits. The more we develop habits, the less we have to depend on willpower. “One of the easiest ways to conserve willpower is to make a behavior into a habit. When something is a habit, we don’t…have to make decisions.” In the book, Rubin identifies 21 strategies to use to make or break habits that will work for each of the personality types she identifies: Upholder (one who meets inner and outer expectations), Questioner (one who resists outer expectations but meets inner ones), Obliger (one who meets outer expectations but resists inner ones), and Rebel (one who resists inner and outer expectations). The takeaway: What bad habits do we have – dropping the mail as soon as we come in, not putting things away when we’re finished with them – that we could change by creating good habits? How would this transform our issues with clutter? Rubin is the author of The Happiness Project and Happier at Home, which we talked about here. 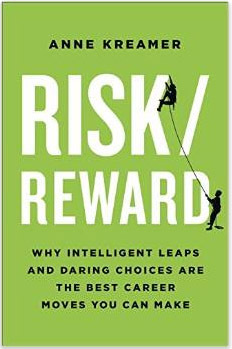 In Risk/Reward Anne Kreamer says that embracing “conscious, consistent, and modest risk-taking at work can help us become more able to recognize opportunity when it appears, and more likely to seize the chance to make the right change at the right moment.” Much of this seems relevant to managing our homes, too. Kreamer writes about four Risk/Reward personality types: Pioneers, Thinkers, Defenders, and Drifters, and presents a matrix so the reader can identify his or her own innate risk style. The takeaway: What conscious risk can we take – one that may seem radical at first but is really modest – that will directly alter the way we look at the tasks we perform to keep our homes in order? How will this help us make the right change at the right moment? Both authors show how a little thought, a little more awareness about what we do each day can lead us to rethink our routines. What works for us, and what doesn’t? If something doesn’t work, can we shed it and replace it with a habit that does work? If a practice works for us, can we enhance it and make it work even better? Are we up to the challenge of taking a risk to change our behavior? The key takeaway from these authors is to be aware of the small things we do every day and to make those moments more meaningful. As Gretchen Rubin says, “What you do every day matters more than what you do once in a while.” Here’s to forming new habits and taking conscious risks to make our days better. 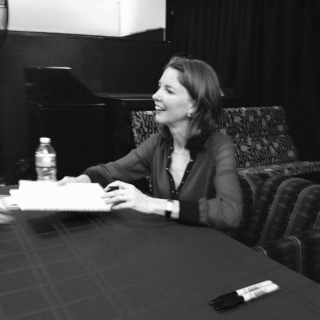 Gretchen Rubin signing books at @Macaulay Author Series.